(My blog content below was originally published in LinkedIn Pulse). There is also an excellent discussion on retailwire. 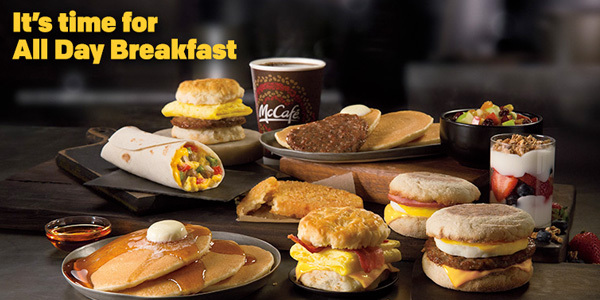 Recently, Media Post reported on the success of McDonald’s offering breakfast meals all day, increasing sales by 5%. “Breakfast at any time” is such an obvious service innovation that the question rattling around my marketing brain is, “What took them so long?” As an outside observer to McDonald’s, I would imagine that they suffered from the following innovation blindspots that your organization might suffer from as well, so be aware of these and find ways to overcome them. Operational efficiency blindness. McDonald’s has always been admired for its operational efficiency…no one can make a quality burger faster or cheaper. However, when your offerings are designed to maximize your own operational efficiency, it means you have lost sight of consumer wants being your driving force. For service marketers who receive customer calls, one simple area to re-investigate is the infuriating number of levels of “press 1 for this, and press 2 for that.” Do you really think that a customer prefers that over talking to a human right away? And by the way, Google, the next time you offer a consumer product like a smartphone, you might want to consider having a customer service number to dial rather than assume I actually want to search your knowledge base. “Category first” blindness. When you think about your product and service offerings as being organized into categories, you become disconnected from consumer choice-making processes. When my honey and I are looking to eat something at midnight, say after a night of me playing harmonica on stage with one of the bands I am in, we are looking for a treat. We are looking for something out of the ordinary. We are looking for a social experience. “Breakfast at any time” is a great alternative! By the way, breakfast foods are often less expensive ways of filling up, so lunch or dinner on a tight budget might lead someone to prefer breakfast as well. So for restaurants, the lesson is, “Don’t confuse meals with meal occasions!” For other marketers, well I’m sure you have your own category-first blindspots. Retailers might be the worst, organizing stores and shelves by product categories, rather than themes that can be reinforced with secondary placement. The way to break this up is to define your markets in terms of need states rather than categories. For example, don’t think of the category as meal replacement bars, think of it as “fueling while driving”, or “pressed for time”, or…well, you get the idea. This means that research teams need to segment moments, not just people. Frankly, my needs as a consumer are usually better defined by moments anyway. Precedent bias. The way you have always (successfully?) done things is a strong influence on the way you do things going forward. Everyone “knows” you stop serving breakfast at 10:30 in the morning so you can switch over the kitchen. By challenging this precedent, look what McDonalds was able to achieve! Every organization has this problem and the biggest one that I work with companies on is the way they budget and then course correct marketing funds. The process is antiquated, sub-optimal, and kills media innovation in the age of ad blockers…not good. And you are leaving significant money on the table…an extravagance you cannot afford in a low growth environment. Assuming the word “innovation” starts with a “P”. Innovation starts with an idea. It can be a media, customer experience, or service idea…it doesn’t have to be a product offering! For example, Dove sketches was a beautiful innovation…a way to communicate and connect brand values that had nothing to do with adding new SKUs. All day breakfast is an innovation, and a successful one at that. If I were advising McDonald’s I would suggest that the next innovation is to combine breakfast at any time with McCafe, make it part of a separate menu board and, this is important, add a separate register line that is purely for McCafe orders. Think of it as the priority line at airports for business class, frequent fliers, etc. As Yogi Berra said (slightly paraphrased), “You can see a lot just by looking”. To see new marketing ideas, you have to remove blindspots.